Carolina Direct Inc. is the perfect furniture store for shopperes in the Greer, Greenville, Spartanburg, Anderson, Upstate, Simpsonville, Clemson, Greer, Gaffney, Mauldin, Asheville, Greenwood, Moore, Piedmont, Travelers Rest, Fountain Inn, Landrum, Easley, Pickens, South Carolina area. 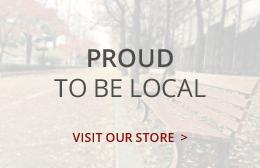 Located at 3088 S. Hwy 14 in Greer, South Carolina, we have trained salespeople that will help you disover the perfect bedroom furniture, living room furniture, dining room furniture, and more in Greer, SC. With a wide selection of bedroom furniture, kid's room furniture, living room furniture, dining room furniture, guest room furniture, accent furniture, accessories, and other furniture in Greer South Carolina, Carolina Direct has friendly and knowledgeable salespeople who will help you find the perfect furniture for your South Carolina home. We carry bed, mattress, nightstand, dresser, mirror, chest, armoire, table, chair, recliner, sofa, loveseat, sectional, TV stand, china cabinet, or a different type of furniture? We now have a new location within blocks of the previous Pelham Road location, near the corner or Pelham Road and Highway 14. Carolina Direct is proud to serve the Greer, Greenville, Spartanburg, Anderson, Upstate, Simpsonville, Clemson, Greer, Gaffney, Mauldin, Asheville, Greenwood, Moore, Piedmont, Travelers Rest, Fountain Inn, Landrum, Easley, Pickens, South Carolina area. 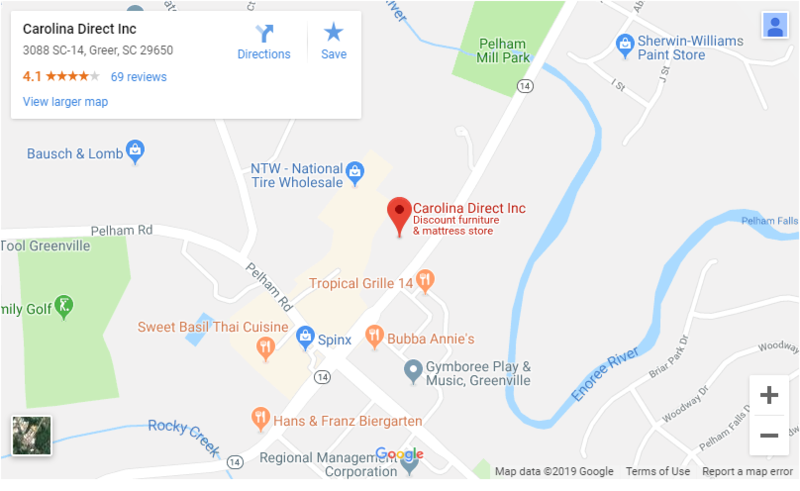 Carolina Direct Inc. is a Greer, SC discount furniture store that serves Greer, Greenville, Spartanburg, Anderson, Upstate, Simpsonville, Clemson, SC, and the entire South Carolina Upstate and surrounding communities. Carolina Direct Inc. sells the same top quality name brand furniture and accents as the larger retailers but at the lowest prices in the tri-county upstate. If you have any questions about our products or services, please feel free to contact our friendly staff either by email or by calling us at 864-284-0525, or by visiting our Greer SC Warehouse Showroom. ALSO Check out our unbelievable Clearance deals found only on our Facebook page or at our warehouse itself. Our family owned and operated Greer, South Carolina furniture warehouse beats the Big Box Stores by keeping overhead down, personal accessibility up, prices down, inventory up, helping as needed, and most importantly dealing with people on an individual basis to find home furnishings that meet your needs, your style preference, and your budget. 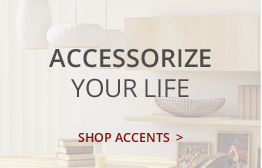 Carolina Direct is your premier Greer, South Carolina Furniture Store. Carolina Direct Inc. offers you unprecedented selection at economy, good, better, and best price points. 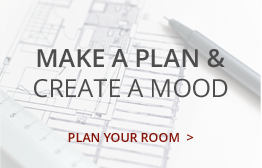 Your needs will vary based on the purpose and use of your furniture and mattresses. That’s why we offer a wide ranging selection that enables you to buy what you need at a price that you can afford. You can save up to an additional 10% when your furniture purchase is bundled with mattress buys, is for multiple rooms for your home, and is made using cash or debit card at Carolina Direct in Greer, SC.